« New Taco Ordinance in Rancho Palos Verdes? hooraaaaayyyyy for the taco trucks. I’ll be the at the meeting for sure. Stop trying to distroy our culture, we Mexicans can’t help it if your jealous because as Americans you have no culture. Let my people be free to create a business. Let people live or would you rather they steal and kill?? As a former Los Angelino and taco truck dependent, I scream out from St.Louis, Missouri….SAVE THE TACO TRUCK! 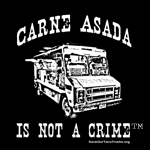 Red tape be damned, these trucks are invaluable not only to the food scene, but to the Hispanic culture. Quick trying to make things “better” you silly bureaucrats. Taco trucks make life worth living, if but for the few glorious moments you are enjoying their fine fare. Oh, what I wouldn’t give for a few of my former taco gods to wind their way east and settle in St.Louis. This country can’t survive with out taco trucks! SAVE OUR TACO TRUCKS!